Wasps centre Elliot Daly has been given a three-week ban for verbally abusing a referee during his side's 31-15 Premiership defeat at Exeter Chiefs. The 22-year-old pleaded guilty to 'acts contrary to good sportsmanship' at a Rugby Football Union hearing in London. Daly will be out until 16 December, meaning he will miss Saturday's match with Leicester Tigers and consecutive Champions Cup fixtures with Castres. "I would like to apologise for what I said to Ian Tempest," said Daly. "The language I used was inappropriate and it was wrong of me to criticise the referee. "Respect for the referee is paramount and I crossed the line. I have already called Mr Tempest to apologise personally for saying something in the heat of the moment, which I regret and wish I could take back. "I made a mistake, now I need to take the punishment and make sure it never happens again." 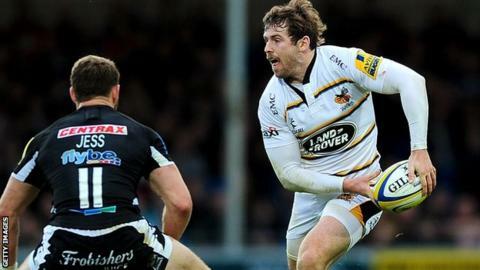 Former England Under-20 international Daly has also been disciplined internally by Wasps.